Call it the anti-Facebook effect, but this private group text messaging thing is starting to get some serious traction. The chart above shows the growth in text messages per day going through GroupMe, the group chat startup that launched last May at the TechCrunch Disrupt Hackathon. 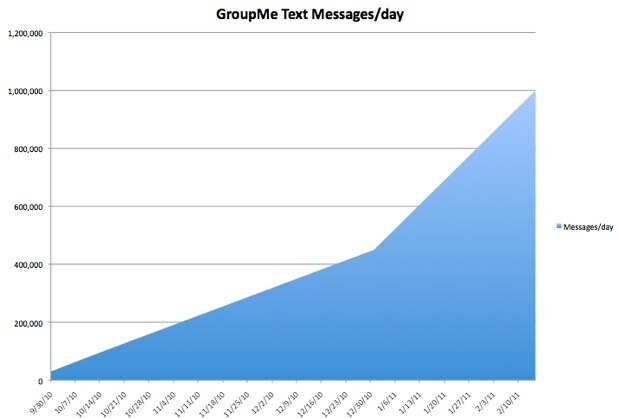 By the time our San Francisco Disrupt came around in September, GroupMe had reached its one millionth cumulative text message, and was doing about 30,000 text messages a day. Fast forward to today, and it is now doing one million text messages per day. That is an incredible ramp. In mid-October, it was at 100,000 messages per day, which ballooned to 450,000 messages per day the last week of December. And now a month and a half later it’s doubled again. (Note: I made the chart above based on the 4 plot points GroupMe provided, which is why it is not as smooth as it should be). GroupMe lets you create private groups on your mobile phone and send SMS messages to everyone at once. It is perfect for ski weekends, coordinating a night out with friends, or back-channel communications at a conference or event. (Competitors include Beluga and Fast Society). You can set up a group on your phone with an iPhone or Android app to send group text messages, share photos, or initiate conference calls. So one message can easily turn into 6, 12, or more individual texts (up to 25 people can be in one group). Although GroupMe has plenty of cash right now (it just raised $10.6 million in January), paying for all of those text messages will become expensive fast. Of course, the more SMS messages it pushes through its system, the better discounts it can negotiate with SMS aggregators, but even at a penny per text (which is a complete guess on my part), that would be $10,000 per day for 1 million texts. Even if GroupMe is paying a fraction of that, it’s texts keep growing and the charges can add up fast. (For heavy users without unlimited text messaging plans, this can become an issue as well since carriers charge both senders and receivers of text messages). On Friday, I visited the New York City offices of GroupMe and founders Jared Hecht and Steve Martocci have some interesting ideas for generating revenues, including sponsored groups which could be location-based. They’ve experimented with these already. But I think a better longterm solution, and I’ve discussed this before, is to offload as many messages as possible off the SMS infrastructure and just do it app-to-app over the mobile data pipe. That way SMS becomes the lowest common denominator for people in groups who don’t have smart phones, and everyone else can chat over the “free” data pipe (free to GroupMe, that is).